I haven’t seen much Apple TV discussion as of late. Most of the usual suspects have spent the past few months talking about the iPad, Apple’s education offerings, and the continuing mediocre state of the Mac. But I think it’s time to highlight a handful of my favorite apps on Apple TV — a platform that has lived on my TV’s first HDMI port since it was just a silver box that ran a modified version of Mac OS X.
TV: This may go without saying, but Apple’s TV App is probably the best application on the entire platform. 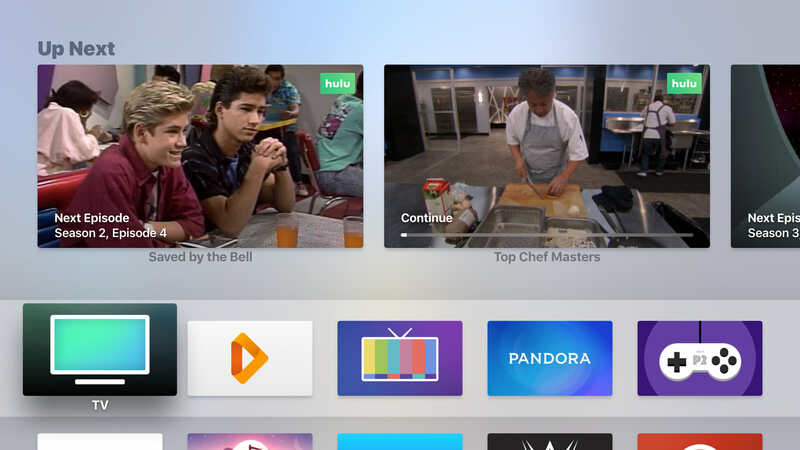 It aggregates dozens of media apps into a single interface, features a fantastic Top Shelf extension, and has become the center of our Apple TV experience. I currently have it connected to Classix, Crackle, CW Seed, HBO GO, Hulu, PBS, Pluto TV, Amazon Prime Video, The CW, and Tubi TV. Even if you only use two of the supported services, you should probably be using the TV App. Provenance: It’s not available in the App Store and requires sideloading through Xcode or Cydia Impactor, but it’s definitely worth the trouble. Provenance is an emulator that supports NES, Super Nintendo, all flavors of Game Boy, Sega Genesis, and more. It’s also recently added support for PlayStation and Nintendo 64, although my experience has been less than stellar — I haven’t been able to get playable frame rates for either of these consoles on my Apple TV. But I’ve had a blast playing Pokémon Red, Mega Man X2, and Rocket Knight Adventures. Infuse: This is a new addition to my tvOS home screen, but its quickly become a favorite. My wife and I use Infuse in place of the Plex app for streaming video from our Plex server. It might not sound like much, but Infuse let’s us ignore the photos and music that we keep in our Plex library. We can continue to backup our photos and playback music in the Plex app on our iPhones without that content getting in our way when we want to watch Back to the Future or an episode of Boy Meets World on our Apple TV. I’ve also found Infuse to be much more pleasant to use than Plex, which often felt a bit clunky to navigate. Infuse’s interface is gorgeous and simple — exactly what I’m looking for in a media app. Player2: Another new addition to our Apple TV’s home screen. Player2 is the best Twitch app on tvOS. It features a minimal interface, a great Top Shelf extension, and a handsome icon. Pandora: One of the longest running streaming music services on the internet and our go-to app for playing audio when we have guests at our house. We just turn on our finely tuned “90s Alternative Radio” station and let the audio play in the living room or AirPlay to the HomePod in our kitchen. And I expect Pandora will see even more use when AirPlay 2 ships and we can play music in both rooms at once. Quiplash: My favorite party game on Apple TV from the fine folks at Jackbox Games. Each player is presented with a number of questions on their smartphone and they give their best or funniest answer. The answers are then pitted against each other and players must vote on which they like best. Points are awarded proportional to the number of votes and the player that earned the most points by the end of the game is the winner. The game can be a bit vulgar at times, but it offers a family-friendly filter if you’d like to get the youngsters involved. Alto’s Odyssey: I’ve written briefly about Alto’s Odyssey before and what I wrote still stands — “all I want to do is bounce off hot air balloons and wall ride over chasms”. It’s the best game on the platform for a quick gaming fix. Channels: If you’re interested in cutting the cord, but don’t like the idea of paying through the nose for all the necessary streaming video subscriptions, an HDHomeRun, an inexpensive antenna, and Channels on the Apple TV is a pretty sweet solution. This setup lets you watch free, over-the-air television on every Apple TV in the house. You won’t be able to DVR your favorite shows without additional software — Plex and Channels DVR are great options —but you’ll have access to sports broadcasts that would be expensive to watch by alternative means. Minecraft: The game was initially released in 2011 and runs on just about every platform under the sun, but its still a lot of fun to play. I’ve spent dozens of hours building shelters, running from Creepers, fighting Skeletons, and mining for diamonds. It’s everything I loved about LEGO wrapped in a survival video game. And no matter how much I play, I always end up returning to it a few times each year.